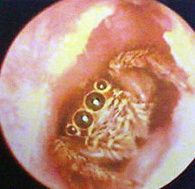 Thanks to @beubank for alerting me to this story about a spider who lived in a woman's ear for 5 days before being removed. As an aside, in typical media blunder of factual error, in the Huffington Post, a picture is shown of the spider stating an "x-ray photo"... COME ON!!! The picture is NOT an x-ray in any way shape and form!!! It's just a regular ordinary picture one takes with a camera. On that note, August 9, 2012 must be the time for all media to report on all sorts of things found in people's ears and noses. Fox News reported on a story about a lego being stuck inside a kid's nose for 3 years. In the past year, I must have removed several cockroaches, ticks, rocks, pebbles, play-doe, paper, cotton, and even one moth. Never a spider however. In perhaps one of the most impressive arrays of foreign objects removed from the ear, nose and throat (I believe in the thousands) is on display at the Mutter Museum in Philadelphia. All objects were removed by a single ENT (Dr. Chevalier Jackson). If you are ever in Philadelphia, this museum is a must see. She should have charged it rent. She did charge him rent ...equal to his life .